Ridlins track was red hot as Spartans struck gold at the Hertfordshire Track and Field Championships in Stevenage on Bank Holiday Monday. They won 16 GOLD, eight SILVER and one BRONZE medal. Three Spartan women won three GOLD medals. They were YUKO GORDON (W60) in the 800 metres; 1500 metres and 3000 metres for women 65 plus; ALISON WOOD (W50) in the 300 metres; 800 metres and 1500 metres for women 50 plus; and TESSA STEPHENSON (W50) in the shot; 100 metres and 200 metres for women 50 plus. SHARON CROWLEY, 50 plus, took GOLD in the hammer throw and 3 kilometre walk and BRONZE in the 1500 metres. JIM BROWN (M60) was the leading Spartan man with two GOLD starting with the 1500 metres at 11.15a.m. and then with 12.5 laps for the 5000 metres as the temperature hit 26 degrees plus at 3p.m. PENNY SCHENKEL won SILVER in the 1500 metres then moved up top GOLD in the 3000 metres for women 40 plus. The other multiple medal winners were PAUL HOLGATE (M60) SILVER in the 1500 and 5000 metres and STEVE GOUGH (M40) with SILVER in the 100 and 200 metres. CRAIG BACON (M40) took GOLD in the 1500; CATHY CRAIG (W60) also GOLD in the 1500; ANTON McCALLA (M40) GOLD in the triple jump while MICHAEL ANDREWS (senior, 18-39) won SILVER in the 1500 and DAVE STEPHENSON (M50) SILVER in the 100 metres. The championships included all age groups for the 1500 metres and a wide range of track and field events for veterans (35 plus for women; 40 plus for men). Anton McCalla 100m 13.7 ? There was a second county championship event on Monday and CLAIRE EMMERSON won the Spartans fifteenth GOLD medal of the day. This was the Pednor Five Mile race which included the county five mile championship for veterans. Claire won the women 45 plus championship with a superb 38 minutes 16 minutes on the undulating course. The Spartan women’s team started their defence of their Eastern Masters Track and Field League title by winning their home match at Ridlins Wood Stadium in Stevenage against Marshall Milton Keynes AC, Cambridge & Coleridge AC, Bedford & County AC, Biggleswade AC, Bedford Harriers and Luton AC. The team of Monica Brown, Christine Lathwell, Alison Wood, Stephanie Mayfield, Sharon Crowley, Iris Hornsey, Andrea Westcott, Yuko Gordon and Tessa Stephenson had nine wins between them. 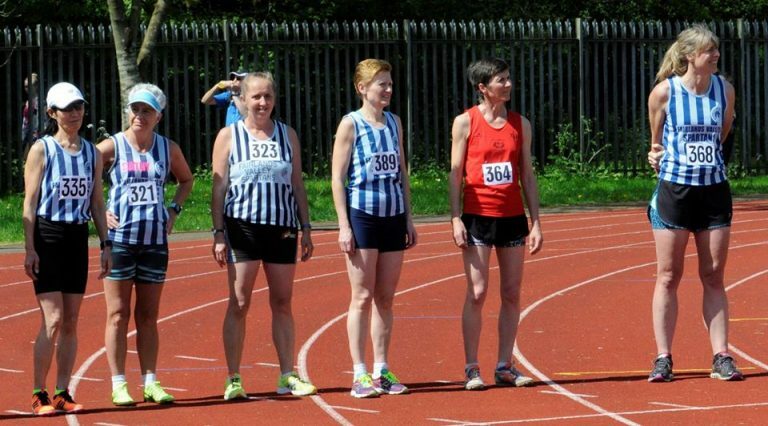 The highlight being the 4x100m relay team for 50 to 59 year olds which saw Monica, Alison, Sharon and Tessa set a new league record by nearly two seconds. Meanwhile, the men’s team comprised of Mark Freeman, Steve Mayfield, Dave Stephenson, Richard Bruce, Chris Westcott, Anton McCalla, Ciaran Mcanery, Peter Smith, John Harris, Barry Osborne and Paul Holgate finished second in their match whilst managing to cover all the events in the evening for the first time, which was a great advantage against the other teams. Richard Bruce won the men’s 35- 49 year age group 400 metres race in 55.5 seconds. Barry Osborne won the men’s 60 plus 3000 metre race in 11 minutes, 33.6 seconds and the men’s younger team of 35 to 49 year olds, Richard, Anton, Ciaran and Chris, won their relay in great style. DUNCAN FLOUNDERS ran a very hot, very humid and very uneven (cobbles everywhere!!) Prague Marathon on Sunday. He finished in 4:01:34. On Sunday CAROLE SHELDRICK and CAROLINE CROFT went to Cambridge to run the Wings for Life World Run, where everyone around the world sets off at the same time and 30 minutes later a chaser car sets off to catch you. They said the race started at midday and was incredibly hot and an amazing day. Carole managed to complete 9 miles before being caught and Caroline 6 miles. On Monday Carole and Caroline took a trip back to Cassiobury Park in Watford to do the Kelly’s 10K. Many Spartans know most the route and know it’s got a few hills and on such a hot day they wasn’t a huge amount of fun. But apart from the hills it was a brilliant race and very well organised. Carole Sheldrick finished in 1 hour 9 seconds and Caroline Croft in 1:04:28. No Wombles last week but the Spartans found some Milton Keynes cows this week during the Milton Keynes Festival of Running. The heat was unforgiving hitting 26 degrees in what little shade there was for half and marathon runners. Support from spectators, Marshalls and the running community was amazing all pulling together to get as many runners home safe. Tim Saban ran the half starting his training for Berlin Marathon in an amazing time of 1:39:56 just slightly off his planned pace. Erica Grayson came home in 2:11:56 her last long run in preparation for the Windermere Marathon her second marathon of the year. Emma Martin said “I was so pleased to see Tim and Erica cheering me into the stadium. Really tough in the heat but pleased to have finished uninjured even if it was much slower than planned!” She came in with 4:03:26. SIMON JACKSON came in with 1:33:01 and SAM SIMMONS with 2:33:59. GRANT RAMSAY was the 3 hour pacer for the marathon. He ran the last 10 miles alone and suffered in the heat but managed to keep in target coming home in 3:05 just two weeks after the London Marathon. Tim Robinson entered the Milton Keynes marathon in an attempt to lay the demons to rest following a very hot day in Paris earlier this year where he failed to make a decent time. However, picking the hottest early bank holiday on record to do this proved not to be the wisest of choices. Mile 7 saw a walk/run strategy employed to manage the heat and the last 12 miles were a tough battle against the heat and a search for shade as the midday sun set in. A last minute 600m sprint once in the stadium bought him in just under 6 hours with 5:59:34. Stuart Haycroft took part in the Milton Keynes festival of racing, completing both the MK Rocket 5k on the Sunday and the Marathon on Monday. Despite being very warm, Stuart ran 17:47 in the rocket, improving his 5km PB by just over a minute..
On a hot Monday bank holiday, Stuart completed the marathon in 3:47:35. Adrian Busolini ran the MK marathon in 4:39:59 and Kartik Sharma in 6:10:21. On Sunday Danny Sutton and Verity Fisher ran the Langtoft 10km. Although hot they both paced well and were pleased with their times. Verity finished with EXACTLY the same time as last year, 49:37; and Danny with 47:33. JOHN NELMS completed 81 miles in the Richmond – Oxford event along the Thames towpath. 28 Spartans braved the heat to run in their stripes at Stevenage parkrun this weekend. Despite the hot temperatures, 5 Spartans achieved new personal bests; Danny SCANLON 19:18 PB (7th male), Wills JENNINGS 23:43 PB, Kelly EVANS 24:18 PB (7TH female), Monica SMITHSON 27:27 PB (19th female) and Angie KEELING 28:58 PB. Two Spartans ran their first ever parkrun, Sheryl HANN 30:15 and Gemma PARKER 38:54. Top 20 positions included Jonny PENNELL 18:43 (3rd male), Madeleine PRITCHARD 23:33 (6th female), Susan MCANENY 25:02 (10th female) and Verity FISHER 27:12 (16th female). Elsewhere, three Spartans finished with top 20 positions, Tim SABAN was 5th male home in Canons Park 20:39, Hannah NEALE 7th female at Chipping Sodbury 23:34 and Lucy May FIELD was 13th female at Basingstoke 23:56.